Impress your clients without sacrificing quality with color copying and document reproduction that delivers durable products that last. Your unique works of art are reproduced on high-quality canvas or other mediums with our giclèe prints that look as good as the original. Create vivid reproductions of a wide range of files and documents with our image scanning equipment that delivers files on a variety of media. 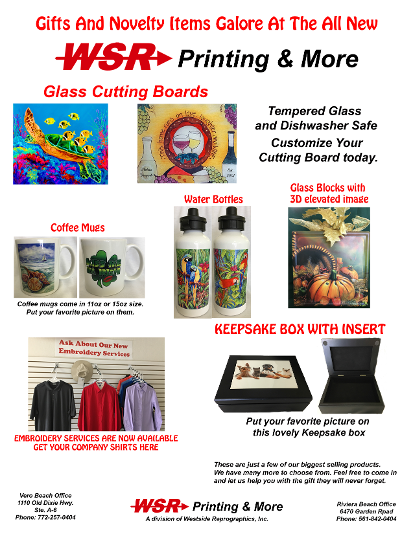 For More Information, Visit Vero Beach Fine Art, a Division of Westside Reprographics, Inc.
West Side Reprographics, "Your Number One Source for All Your Printing Needs" brings you a cutting edge, environmentally conscious design solution. We can now offer exciting opportunities for interior designers and architects to broaden their services beyond the norm of visual concepts for both indoor and outdoor graphic applications. We pride ourselves on providing exceptional value-added services for our clientele. Our goal is to work towards a unique, functional and budget friendly end product without sacrificing the clients' creative vision along the way. West Side is the ideal partner for professionals that cater to high-end residential and commmercial clients. We want your business and will do everything it takes to make a long-lasting and successful relationship. paint brush strokes, stained glass, natural stones and more. West Side Reprographics in Riviera and Vero Beach, Florida, offers a broad range of commercial printing services in just about any format you can possibly imagine. 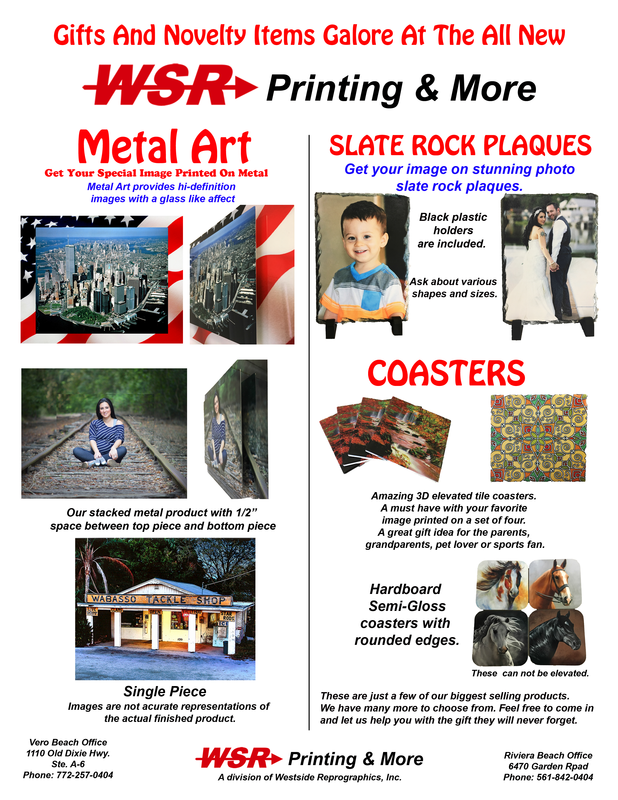 Our advanced flatbed printing process allows us to reproduce images on a wide variety of mediums including doors, glass, and mirrors. We specialize in blueprints for contractors as well as color graphics and reproducing art work. Our company began in 1974 as a blueprint, architectural, and engineering supply service and we have steadily expanded to become a full reprographics company. We provide you with color and black and white printing solutions and copying with the exception of offset work. Contact our commercial printing company for professional and artistic document reproduction.